Designed to deliver the ultimate in smooth, extra-strong, fun-to-fish precision. 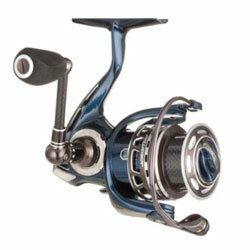 The Pflueger Patriarch Spinning Reels feature featherweight magnesium body, rotor, and sideplate; double-anodized, machined-aluminum spool with carbon arbor; 10-bearing system (XCR stainless steel ball bearings plus instant anti-reverse bearing); Sure-Click Bail with audible signal; anti-twist titanium roller; titanium shaft; carbon handle with EVA knob; and sealed carbon fiber drag. FREE neoprene bag and aluminum spare spool. "I bought this reel a month ago and have now fished with it for approx 70 hours. It is very lightweight and sturdy and my hands dont get as tired when I fish for 12 straight hours like they did with a heavier reel. " "This reel is awesome. The action is great. The casting is smooth and the retrieval is smooth as well." "T"I bought the utralight 9525X model for panfish/trout. I have the heavier Shimano Stella 4000 and the Pflueger Patriarch gives the Stella a run for it's money as far as smoothness for about $500 less! Plus it comes with a free extra spool (the Stella does not)"